Chicks: What happens to the leftovers after they eat? Question: After the chicks are done eating, what do the parents do with the leftovers? Do they eat it themselves? What happens to the carcass? Answer: As you can see in this picture, after the chicks finish eating the adult takes away the remains. If the parents are hungry, they eat the leftovers. If not, they cache it on the cliff or building for later meals. Even if the chicks eat the entire meal, the parents take away the carcass to keep the nest clean. Rotting food and excrement are bad for baby birds and the smell of food would attract predators, so the parents tidy up. The level of cleanliness varies among individuals, though. Tasha, at Gulf Tower, is a good housekeeper. 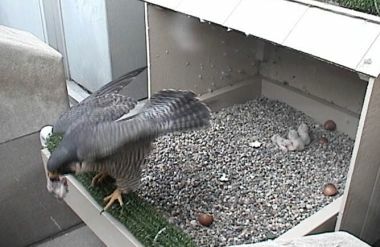 Dorothy, at Pitt, is able to keep up appearances in the first week after hatching but she gives up after that. The difference is amazing. Oh, and the carcass… At Pitt the adult peregrines fly a short distance away from the building and drop the carcass. Sometimes it lands on a lower roof, sometimes on the Cathedral lawn. I have to laugh at the thought! RE: a carcass landing on the Cathedral lawn! As an alumni, I once spent many a sunny day on that lawn. I can only imagine my reaction if a bird carcass landed next to me or on me!! Hilarious!! It looks like the chicks eat raw, “unprocessed” meat. Do the mothers pre-digest the meals at all? How do their little systems handle their meals if not pre-processed? The chicks are born with the ability to digest meat immediately. Their parents don’t have to pre-digest anything for them. As far as I can tell the only difference between feeding newborn chicks and larger ones is the size of the tidbits the parents present to them.